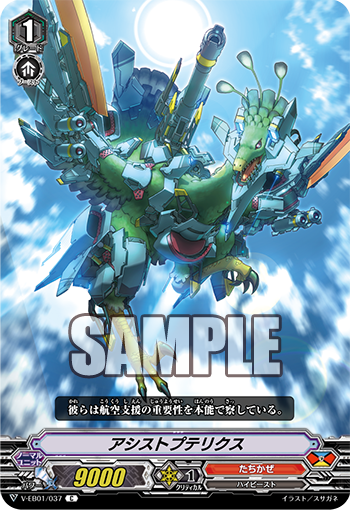 The Japanese Card of the Day for May 29th, 2018, is the first Tachikaze unit of the Standard format and a Common from V-Extra Booster 01: The Destructive Roar, Assist Pteryx. Assist Pteryx is a clone of the Nova Grappler unit Death Army Guy. Like all vanillas in the Standard format, Pteryx's stats are determined by the Gift their clan possesses. Force clans like Spike Brothers have grade 1 vanillas with 8000 power and 10000 shield, Protect clans like Megacolony have vanillas with 7000 power and 15000 shield, and Accel clans like Tachikaze have vanillas with 9000 power and no shield. This helps makes their 9k base grade 2s reach the 18 threshold, which is the minimum number required to force a 10k or more shield from a base 13k grade 3. It can also function as a strong defensive opening ride that forces all other unboosted grade 1s to hit a trigger if they're to hit at all; the only exceptions being Damanance Dragon and Gabiya. Of note is that Pteryx's card number is V-EB01/037, putting it before Funky Bazooka and Karma Queen and solidifying the set order as Tachikaze > Spike Brothers > Megacolony. This is the same set order used for these clans since their debut in BT01 seven years ago, and it means we know the set numbers of their respective Vanguard Rares. (Presumably Gigarex, Siefried, and Spark Hercules.) It also means Tachikaze is set for no more than 12 Commons (034~046) as the Rares begin just two slots above Pteryx and to have any more than that would keep Spike Brothers from having any grade 3 Commons. Taking into account Trial Deck support for Royal Paladin and Kagerо̄, that's fewer Commons than any other clan in Standard--Oracles had 14 and Novas 15 in V-BT01. That's just the price of being in an Extra Booster with only 33 Common slots; the most realistic assessment is that each clan in V-EB01 will get 11 Commons each, evenly dividing the space between the three so that no clan gets more or less support than others. Following that logic, each clan would have 2 RRRs, 3 RRs, and 5 Rs. The previous Japanese Card of the Day was Phantom Black.